Computer users are being urged to update the Firefox web browser to close serious security holes in it. Some of the security lapses in Mozilla software, which Firefox is based on, could allow malicious hackers to hijack computers. There have been a total of 21 security flaws in various versions of Firefox, according to security firm Secunia. 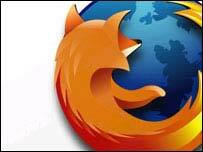 Users are urged to download the latest versions of all Mozilla programs to protect their computers from attack. The US Computer Emergency Readiness Team (Cert) warn that other Mozilla products including e-mail client, Thunderbird, and the internet application, Seamonkey, may also be affected. The Mozilla Foundations have released a new version of Firefox and Thunderbird which contain fixes to some of the security flaws. Programs like Firefox have been thought to be more secure than other browsers such as Microsoft's Internet Explorer because of its links to the open-source software community. There have been more than 100 million downloads of the Firefox software since its launch in 2004. However, Internet Explorer is still the world's most popular browser with over 80% of the market. Last year both browsers were hit by the same security bug. The new security alert is thought to be the first time that so many vulnerabilities have been exposed in the Firefox browser. Users should make sure they have the most up-to-date version of Firefox, which is version 1.5.0.2. Internet Part II: Return of the geeks?